The aroma is richer than ordinary tea. I love the nutty roasted taste. Soba is known as noodle made of buckwheat. Soba-cha, soba tea is not tea technically, because it is no made of tea plant. It is buckwheat. Without any proof, I assume myself that it doesn’t have caffeine so I drink it even before going to bed (^^;;. The sweet nutty flavor soothes my mind. This is interesting, I have never seen buckwheat tea. How does its taste compare to barley tea? 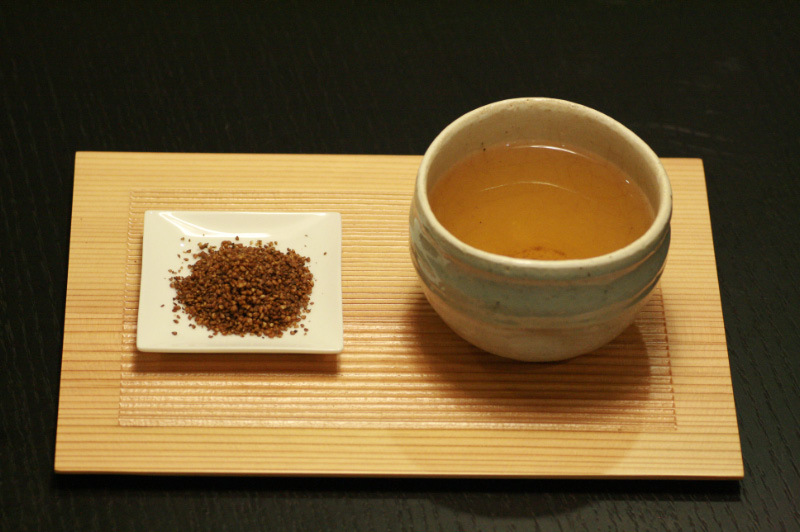 Buckwheat tea is similar to barley tea in that they both have roasted flavor and mild bitterness. The difference is that buckwheat tea is sweeter and has powdery flavor. “Powdery” may not be appropriate word to describe a flavor, but I’m sorry that I don’t know correct English. I taste that barley tea is clearer and buckwheat tea has mellow and rounded flavor with powdery texture. I know the tea doesn’t actually have powder texture but I taste like that it would have the texture. I hope you understand what I want to try to say. Ah yes, interesting, thank you! Buckwheat(soba) tea is a very good tea for health. Is there any other way to prepare mellow tea?